Alexandra Rickham & Niki Birrell have taken a convincing win in the SKUD 18 fleet at Garda Trentino Olympic Week, the second leg of the Eurosaf Champions Sailing Cup. The British SKUD team finished up with a 10 point margin over John McRoberts & Jackie Gay (CAN), with Marco Gualandris & Marta Zanetti taking third overall. 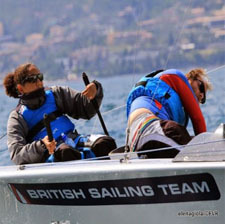 12 SKUDs from 8 nations competed in the event sailed from Riva del Garda at the northern end of the spectacular Lake Garda.